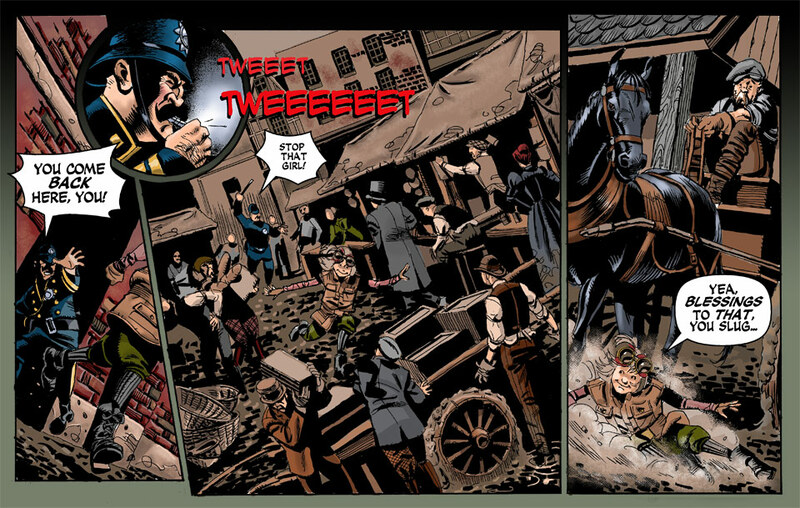 STONE is racing towards us, as DICKENS comes out of the ALLEY in pursuit, raising his whistle. 1. DICKENS:	You come back here, you! STONE vaulting over a CART, much to the dismay of those around her. She’s having the time of her life. STONE sliding beneath a HORSE, DICKENS already falling behind. 3. DICKENS/small:	Stop that girl! Love it, I can’t wait for Drake and Drum to meet these two. “Slug” on its own is descriptive. In a world where flying is common place and buildings tower higher than reasonable (featherwood framing elements?) the lowly slug is ground bound and unremarkable. From the context, I’d say “Blessings” is probably the local idiom for “Good luck”, which can be either sincere or sarcastic depending on your tone of voice. So she’s basically saying “Good luck with THAT, you slug!”, clearly in a sarcastic tone. I like how in 3 panels I got a sense of the action and the chase. OK. I have to ask. How the heck does the “Webley Mark X” work? Does it empty the cylinder first and then go to the magazine? (I assume when you say “Clip holds 4 rounds” you mean that the magazine is loaded with stripper clips.) If so, why have the cylinder at all? The cartridges are rimmed, so I can’t see how you’d feed them from the magazine into the cylinder or why for the love of Rube Goldberg you would want to. It does seem incredibly complicated. But Steam Punk. Note banding on the round casing. Each of the 4 chambers expands and collapses either passing the rim or clamping on the casing as the chambers are rotated bottom to top. The clamping action also allows for some sort of ejection as the cylinder rotates. With the fixed placed ejection port it would seem the revolver is covered. Lets make it dual revolver, top cylinder with 3 slots, one in the barrel one loaded, one just ejected. The bottom cylinder also has 3 slots, 2 loaded, one empty. The bottom cylinder is loose where it gets rounds from the clip. The two cylinders rotate 120′ at the same time and hand off a round from bottom to top as they pass each other. At the same time a round moves from the clip into the bottom cylinder. Your versions both make sense. Terrifyingly Rube Goldbergish sense, but they do have a clear internal logic. I think I’d use it without hesitation… as a fishing weight for mature halibut. It took Webley IX versions to get this far. Give them a break!